This week I had the privilege of visiting a local Baltimore high school that is making history in winning a spot in a national tournament. 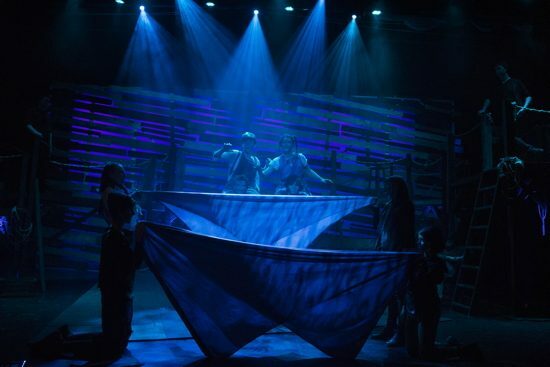 This history-making event doesn’t take place on a basketball court or a football field, it shines brightly on a mainstage in a theatre over 1,000 miles away. The local high school is Jemicy School, in Owings Mills, MD, and the history-making event is the 56th Annual International Thespian Festival, (ITF). ITF is produced by the Educational Theatre Association (EdTA) that celebrates student achievement in the performing arts. The 56th event, which this year takes place June 24-29, brings together more than 4,000 high school drama students and their teachers for a weeklong immersion in workshops; interaction with colleges, industry leaders, and Broadway professionals; and opportunities to be inspired by the best high school theatre in the nation. 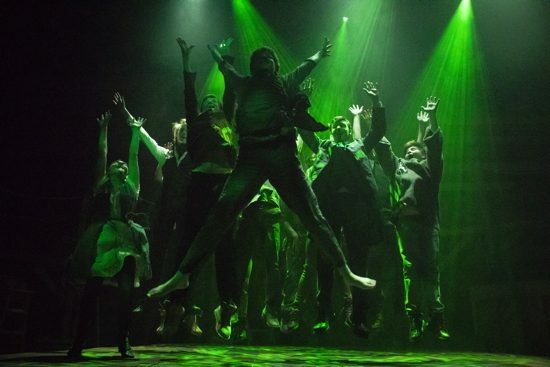 “Peter and the Starcatchers” is a prequel to “Peter Pan” based on the children’s book by Dave Barry and Ridley Pearson and freely adapted for the stage by Rick Elice, with co-directors Alex Timbers and Roger Rees. For two-and-a-half hours, twelve actors make theatrical magic by playing dozens of characters: sailors, pirates, British naval officers, Mollusk natives and orphans in addition to eighteen major roles. The original Broadway production was a deliberately low-budget spectacle: an extravaganza of staging that relied on suggestion and storytelling rather than expensive set pieces like the chandelier in “Phantom of the Opera” or the helicopter in “Miss Saigon.” Elice’s script, jam-packed with poetry, fart jokes, gentle lyricism, and numerous nods to pop culture, is a coming-of-age adventure story about how a nameless orphan — inspired by a remarkable and ambitious girl — became the strange and celebrated hero that is the Boy Who Would Not Grow Up. I was lucky enough to have the opportunity to meet with this cast and ask them questions about how they felt to be making history. 1. You are the first school, the first cast and crew in over 20 years to represent Maryland on the mainstage at the International Thespian Festival. What does this mean to you? Chloe – It means a lot to represent the state of Maryland. When we see others who win a spot in this Festival (usually) an entire state is represented by a combination of high schools theatre troupes across that state that comes together to perform one show. But Jemicy is a school of 200 kids and we pick from a pool of 200 dyslexics and or 200 people with learning differences so to have a small state and probably one of the smallest high schools in the state go to nationals is an insane honor. That it is also the first in 20 years is also crazy! 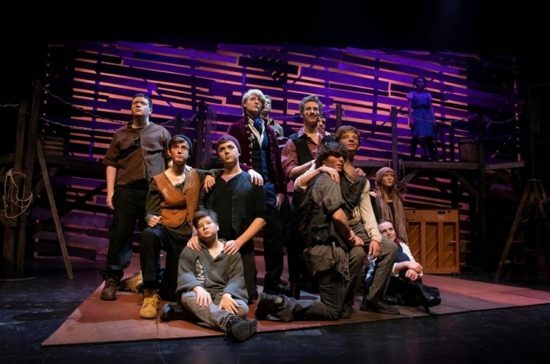 Noah – When you think of High School classes you don’t’ think of professional productions, but we were able to pull off that level of professionalism. Ethan – Knowing we are able to do something as a family and that everyone pulled their weight is amazing. There’s not one person in this production that I felt didn’t do everything they possibly could. Daniel H. – This is staying that you don’t have to be from New York, you don’t have to be from a performing high school to do this, to achieve your dream. Chris – Never did I think I would be cast in a play that opens up many doors and new opportunities, theatre has made my life so bright, coming in as a Freshman, I never thought I would do this. Matthew – Most of the cast is freshman and sophomores so it is really impressive to find this level of professionalism. Darby – It is cool to see this program grow, in terms of numbers and people. To experience different things and be chosen to perform for people all across the country. Gracie – I’m on the tech side and it used to be three kids and now we can fix issues that come up. I did fight choreography and to see this cast learn what I taught them and to have them make it better and to show it to nationals is something I never dreamed of. 2. Why do you think this cast and this production was chosen at this time? Daniel C. – Because of how professional it is and because we invest so much time into it, the sets, the acting. Other high schools probably don’t invest so much into it. We put everything into it. Like everything, blood, sweat and tears. Fletcher – I think with a lot of shows, some cast members don’t like each other. I would say that this cast is more family and genuine friends. Going to rehearsal and having fun, it makes the show better because we are friends. We do funny things with each other and it’s not forced because we are friends, we have fun doing it. Ethan – What makes the show incredible is the chemistry between everyone. There is not a single moment where we are not happy on stage. And you would think that everything has to be focused on this role or that one, but every single role matters. Everyone in this room tried their best, they learned their lines. and everyone tried their hardest. Everyone interacts with everyone on stage and because you have to do that you are forced to interact. You might not like someone at first but because you are spending 8 hours a day with them during tech week, you become a real family. There is not one person in this room that I don’t know personally. Darby – I got to see this production from backstage and I got to see the production as it was coming together everyone was working together. The way the show it’s very ensemble-based and everything has to come together. It’s really cool to see it from people learning lines to knowing each other enough to put on a show like this. 3. Why do you think you all got along so well? Gracie – Something that I have seen a lot in other productions it that tech and the actors sometimes don’t really get along and that is a big, big issue, especially when you are putting on a show and you have to make sure that everyone has connections with each other. 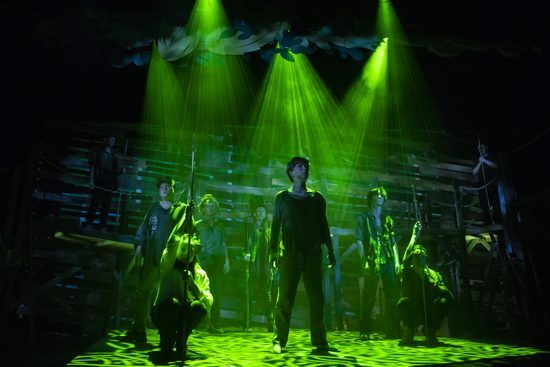 With “Peter and the Starcatchers,” there wasn’t a person in this room who didn’t get along with tech. We got along like we were two peas in a pod. I think that had to do with communicating with each other and some new policies in place to help make this production go smoothly. Meghan – I’ve done “Peter” before and, no shame to my old school, but it wasn’t even as close to as good in every aspect. I think that speaks to a few things, it speaks to how impressive the tech program is here, the set is beautiful. It speaks to Mr. Elias’ incredible directing. It speaks to Mx. Hensen’s incredible ability to wrangle us all and it does speak to how we relate to each other. We spent a lot of time together and then we spent time together outside of rehearsal. 572 hours – that’s a lot of hours! We hung out as friends outside of rehearsal and with that, we had a special connection on stage. This is just a special group of people. Every time I’m in a show, I’m amazed at how great, cool (I ran out of good words) this cast is. Dixon – I thought the show went really well. Usually, there is a cast and separately there are other parts but with this show, we were cast so well, we kind of like made a friendship in a way with our part so it made everything so easy. 4. Why do you think you were cast in the role you were? Chloe – I have so much to say…If I had to say one word about Jemicy’s theatre program it would be magic. I know that sounds cheesy, but this school is literally magical. About the casting – our first rehearsal we all sat down and read the line, “When I was a boy, I wish I could fly.” We all went around in a circle and we all answered the rest of this question, “If I was a boy/girl, I wish I could…. ?” And we got to a very deep tearful conversation that let out a lot of emotions and we learned a lot of personal things about each other. Mr. Elias knows us personally really, really well. Mr. Elias probably knows me better than any other teacher in this school and maybe more than some students in this school – it’s awesome! And I feel like when he casts the shows, not only is he thinking like that, but he is thinking that this character has X, Y, and Z that Darby or Meghan has or this character kind of fits Anthony. And when I read over the cast list I realized how perfect the person fit the character. Bryan – For me as a Captain, I am a very professional person, I just try to be quiet, and I hold myself upright like I think a Captain or officer would and that’s why we get put into these parts because I think Mr. Elias can see our personalities and how it works into a character. This is how the bond happened between all of us because you can be yourself on stage. So I think the casting was smart in that sense. Daniel H. – I think the story of “Peter” means a lot to all of us for a different reason and through the characters we all got to play. We all got to play characters that don’t have the insecurities that we have. We all got to play a character that we all wish we were a little bit. 5. What are you most looking forward to at the Festival? Chloe – I really like the reactions of the audience. I love the energy rush. When we performed in front of the Jemicy (audience) they laughed and it was great but to perform in front of thousands of theatre kids who know the jokes, I am so excited to hear the roar of laughter. I just think it will be so fun! Brian – I’m excited to see how the other casts put together their shows. 6. What about the people who are anxious about getting up on stage? What would you say to get them up there? Anthony – I would say to do it and you have to feel what it is like to it yourself. There are kids in class that say I can’t do it, but you have to try to figure it out. You will either love it or hate it. You just gotta do it, I know we are not like Nike, but (laughter).Confidence is a virtue. Matt – I would just say that even if you’re anxious about it, you just have to try it because you never know. My first time trying out, I was trying out for, “You Can’t Take it With You,” and I ended up being Tony (Tony Kirby and Fiancé of lead character Alice, Son of Mr. and Mrs. Kirby.) So like you just never know. Even if you get a small role, maybe that is your first step into bigger roles. You just have to find your way, you just have to try stuff. Darby – I’ve had theatre class with Mr. Elias in USP (Upper School Preparatory Program) and I remember the first week at the beginning of class we all had to say something and project and I absolutely refused to do it. I would not. So he said you can have this week to not do it and the next week you have to and so slowly through that class, I got more comfortable with doing theatre related things. Even though I wasn’t huge about doing theatre related things. I was terrified about having to talk. So “The Crucible” came around and Mr. Elias wanted me to audition, so I was like, it’s not happening. So the day the cast list was supposed to come out Andrew dragged me to Mr. Elias’ office and I ended up being cast. And I have been involved in every show since that one because I was so terrified to do it, but once I did it I realized that this wasn’t so awful. So the next show we ended up doing was “Proof” and I ended up getting cast in that one. And that was crazy, it was something I never expected. I found that I didn’t have to feel so vulnerable on stage because I can use my character to express myself. I can do it through another character. Fletcher – What I would like to tell someone is that there is always going to be people to help you. When you go into a theatre and are in a show, you not all alone. If you’re scared there are always people to talk to. The people who helped me the most are probably, Ethan, Chloe and Mr. Elias. Because when I came here I was nervous, I did middle school shows but you know, high school is so much different. But there is always someone to talk to and help out. Daniel C. – When I was thinking about auditioning I was scared to do so, I’ll go and do it and see what happens. I ended up getting cast in both plays that I auditioned for. And that is what you just have to do. Don’t worry about anything and just do it! Jada – Everyone is like, you know, go for it, but I personally am not into that. I don’t jump into it. It’s more like I’m going to force myself into this and I’m going to care what everyone says but I’m going to do it, and it’s kind of terrifying. I’m also not one of these people that are loud. I’m glad that I pushed myself though, to do it. I definitely got more confidence. 7. Do any of you plan to pursue theatre as a major in college? Why? If yes, how has Jemicy prepared you for this? Magal – I had no idea, I was in theatre when I was younger, but this theatre program is professional and I found a passion I didn’t know I had. I’ve done theatre before but I didn’t really enjoy it as much as I do at Jemicy. Gracie – I really want to pursue this. I came to Jemicy not knowing what my life would be like. I was brought in by Chloe and it is more like a family. A number of times Mr. Elias said he could see me on Broadway and I would love to do that for a few years and travel around and come back put back in the effort that Mr. Elias has done for us. Jada – So personally on a day-to-day basis, I don’t have my own voice, I don’t have anything to say, but when you put me on stage you have to say something and everyone has to hear you and that is kind of what I enjoy. I struggled to get there but it’s what I really enjoy. Anthony – I was going to do a business major and minor in theatre and bring business into theatre as a source of income but before that, I was part of the kids that asked why are we doing this right now? But once you do it, you learn to love it. I plan to minor in Theatre Studies because of this program. 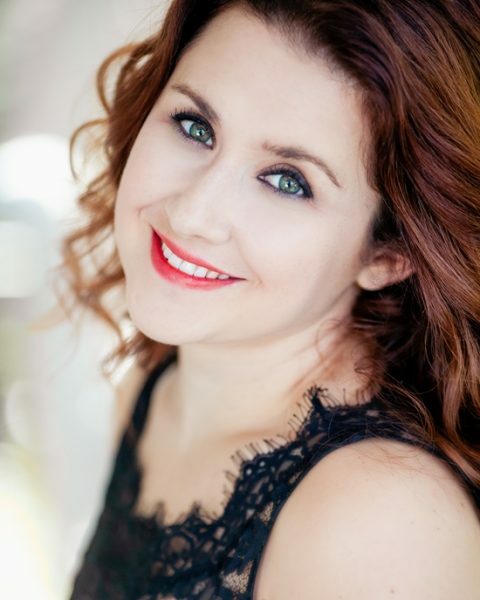 Chloe – I applied to 25 schools and auditioned for 17 for musical theatre. I’m just starting to hear back from colleges now. I’ve heard back from 9 so far. I’m waiting to hear back from some of my top choices before I make a decision. I like theatre and singing before this program but I never had the opportunity to try before this. I don’t think I would have liked it as much if it wasn’t so professional, so encouraging, so great. 8. What has to happen now to get you to the nationals in June? Dedication, work, sleep, learn lines and Mr. Elias. Learn all your blocking and lines – it helps! If you are interested in donating to support the Jemicy theatre program, please contact selias@jemicyschool.org. To get the show to nationals, to pack it up and ship it across the country will cost about $20,000. The total bill including student registration and travel is estimated at $55,000.